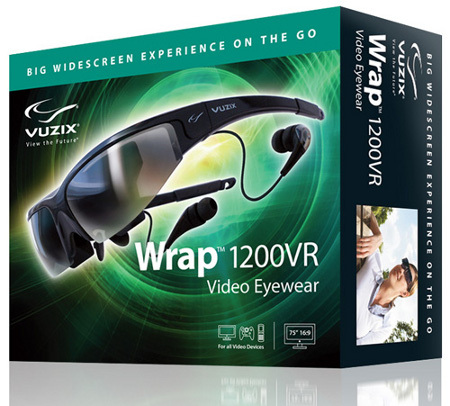 Vuzix is well known for their range of video eyewear, and they are certainly keeping up with the times with their latest release, the Vuzix Wrap 1200VR video eyewear. Why the VR suffix in the model number? Well, VR means Virtual Reality, and it should usher in a new era of video eyewear. The Wrap 1200VR is said to be able to support widescreen VGA video up to 720P, not to mention the latest 3D games as well as upgraded head-tracking to make sure it remains ahead of the pack (while you edge past the Joneses with your latest gizmo). Do not expect to look nerdy with this sunglass-style Wrap 1200VR, as careful thought had been incorporated into the overall design. Capable of bringing virtual worlds to life with its 16:9 widescreen, you can also more or less “step inside” your thanks to the virtual display and superior head tracking capability. The supersized display itself will feature a 35 degree field of view, which is similar to watching 3D content on a 75″ display from as near as 10 feet away. Just what makes up the Wrap 1200VRs head tracking technology? Well, it is known as the Wrap Tracker 6TC that sports a compass, alongside the aid of 9 sensors that work together to create a 3 degree of freedom solution with automatic drift compensation for smooth, realistic motion tracking. Don’t worry about new versions of 3D videos – this model supports the latest side-by-side 3D video format, not to mention playing nice with over 100 titles for 3D video and/or head tracking. Love video gaming staples like Call of Duty: Modern Warfare, Fallout 3, and F.E.A.R.? Fret not, those are all covered. The Wrap 1200VR will be able to hook up to more or less any Windows graphic card desktop or laptop computer, never mind the make or model. Windows 7, Vista and XP (32 and 64-bit versions) will also be supported, making the Wrap 1200VR more or less the perfect big screen interactive gaming monitor. Throwing in optional interfaces, the Wrap 1200VR can connect to component video devices such as the Xbox 360 and PS3. All that technology is not going to come cheap though – we’re looking at a price point of $599.99, but good thing it is large enough to fit over most prescription eyewear – unless you use a frame that is extremely artsy and way out large.